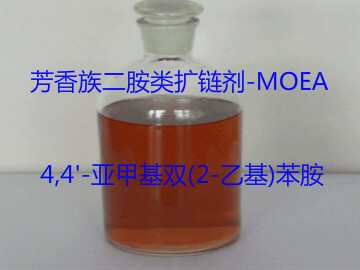 Aromatic Diamine Chain Extender MOEA - ZhangJia Gang YaRui Chemical Co., Ltd. This Product Is An Amino-Orthoethyl-Substituted Aromatic Diamine Chain Extender. It Has Good Compatibility And Compatibility With TDI And MDI Prepolymers. The Reaction Speed Is Faster. It Can Be Used With E100 For Reaction Injection Molding And Poly. Urea Spraying Process, The Product Has Excellent Physical And Dynamic Mechanical Properties. Used For Polyurea Elastic Waterproof Material, Can Effectively Improve The Strength Of The Material, Resist Puncture And Anti-Aging Properties Of Plants. This Product Can Also Be Used As A Curing Agent For Epoxy Resins, Giving The Product A Good Tensile, Tear Resistance, Electrical Insulation And Heat Resistance. 4,4'-Methylene Bis (2-Ethyl) Aniline (Aromatic Diamine Chain Extender MOEA) Package: 200Kg Galvanized Tin Barrel. If Aromatic Diamine Chain Extender MOEA product is not what you want, we can be customized according to your needs, please send us your order to Email: sales@yaruichem.com , or click here to post your buying lead.